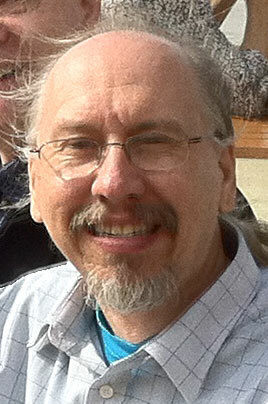 Robert Hanson is the Edolph A. Larson and Truman E. Anderson Sr. Chair of Chemistry and currently serves as chair of the St. Olaf College Chemistry Department. He joined the St. Olaf faculty in 1986 after earning a B.S. from the California Institute of Technology, a Ph.D. from Columbia University, and completing postdoctoral work at the Massachusetts Institute of Technology. Hanson has published numerous articles in the areas of chemistry, material science, informatics, and mathematics, as well as two books: Molecular Origami: Precision Scale Models from Paper and Introduction to Molecular Thermodynamics. He is the co-inventor on one patent titled Catalytic Asymmetric Epoxidation (with K. Barry Sharpless, who received the Nobel Prize in Chemistry in 2001). Since 2006 Hanson has been the project leader and principal developer for the Jmol Molecular Visualization Project, a global open-source interdisciplinary effort to develop novel web-based capabilities for the visualization of molecular structure and energetics. Applicable in a wide range of fields, Jmol and JSmol can be found on thousands of websites. At St. Olaf, Hanson primarily teaches organic chemistry and has worked to further the college's green chemistry curriculum. He also developed the Interim course Medicinal Chemistry in Jamaica: An International Perspective, which brings students to the University of the West Indies in Kingston, Jamaica, every other year for an in-depth look into how drugs work and how they are designed and developed, with a particular focus on the interactions of culture, traditional healing, and pharmaceutical medicine. 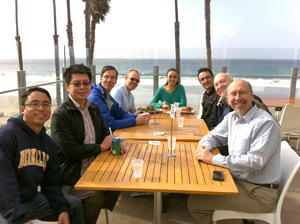 Bob Hansen (right) with the RCSB PDB San Diego Team in November 2013. Bob worked with the RCSB PDB on optimizing the Jmol/JSmol options at rcsb.org. But perhaps the most fun for me has been to see how Jmol can be used in venues that have nothing to do with the web, and especially those that have wide general audiences such as the Molecular Playground and the NSF-funded Touch a Molecule/Take a Nanooze Break. The Molecular Playground was the brainchild of Craig Martin (University of Massachusetts Amherst). Former Computer Science graduate student Adam Williamson built the hardware and coordinating software and the Department of Microbiology's Eric Martz (Professor Emeritus and developer of Protein Exporer, First Glance in Jmol, wrote the Jmol scripts. The Molecular Playground projects an interactive and "way bigger than life size" molecule on a wall. When unsuspecting visitors wander by, they are quite surprised when they notice that their actions can control the projection. An IR detector (iteration 1) or a Kinect(@) sensor (iteration 2) tracks and transmits motion to a stand-alone Jmol application running on a nearby Mac Mini. Needless to say, the Molecular Playground has been a hit at St. Olaf. It happens to be a perfect location, just inside the main entrance of our magnificent Regents Hall. 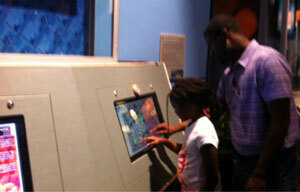 Several recent students said that they were wowed by it during their admissions tour. A video shows a couple of St. Olaf College students captured by their own curiosity. An interesting aspect of the Playground is that it is programmable. Hai Nguyen, an undergraduate at Carleton College, and I developed a whole series of selectable demostrations relating to first- and second-semester organic chemistry. Visiting seminar speakers get to see their own work displayed. I can log into the system from my iPhone and select pertinent illustrations for an entire semester. The only problem we have had over three years' use is that Kinect sensors are really not built for long-term use; we have gone through two of them already. 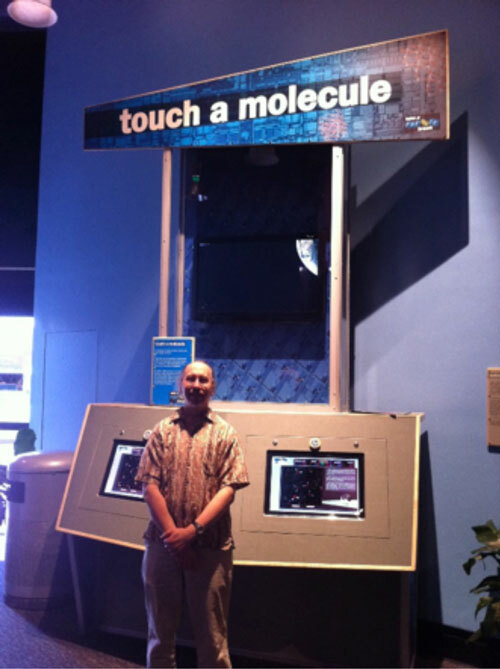 Bob Hansen (top) and an user (bottom) in front of the Touch a Molecule kiosk. Not far from UMass is another brainy guy, Carl Batt, in the College of Agriculture and Life Sciences at Cornell University. 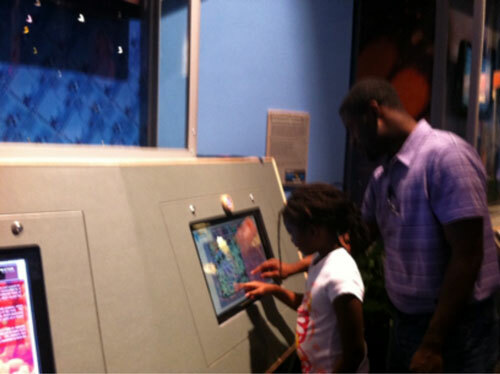 A few years ago, Carl was approached by Disney to create a nanotechnology exhibit for the Epcot Theme Park at Walt Disney World in Florida. 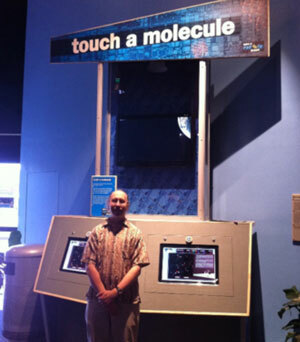 One part of that installation is Touch a Molecule, which embedded two 23-inch HP TouchSmart touch screen computers in a kiosk. This installation runs Jmol in a Firefox web browser in "kiosk" mode — a special mode that allows user interaction but doesn't allow exiting the browser without a keyboard (which are hidden in the locked cabinet behind the screens). The display shows a large Jmol applet on the left, five large tabs at the top offering different experiences, and a panel with text on the right providing a bit of context. User gestures are passed to Jmol in a similar way as in theMolecular Playground––a specialized driver written in C++ calls Jmol via a local web socket connection. During January of 2012, I spent many fun-filled 16-hour days dreaming up and developing these five scenes, which involve a rhinovirus (4rhv), a deoxy/ oxyhemoglobin morph (courtesy of David Goodsell, see RCSB PDB's Molecule of the Month, May 2003), two infinitely navigable crystals (quartz and silicon), and a simulation of water as a liquid. The virus and hemoglobin are both great fun, but I must say that I especially enjoy the crystals and water, which required several new Jmol features to pull off. These scenes utilize Jmol's navigation mode to take the viewer for a ride right into the scene and required some great tricks to give the illusion of infinite space. 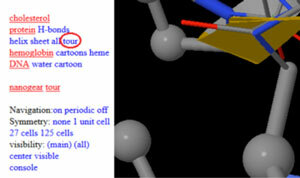 Our secret test page for Touch a Molecule can be viewed at www.stolaf.edu/people/hansonr/jmol/epcot. Remember, though, this was developed for a very specific platform – don't expect the full experience from a distance. This installation has been running at Epcot since February, 2012, and at last count had registered approximately 160,000 visitors per year. Still running in Florida, Take a Nanooze Break was recently cloned for the Innoventions attraction in Tomorrowland at Disneyland, in Anaheim, California. For a bio-related navigation experience, take the protein "tour". Can you name those amino acids as they fly by? Viewer caution: It's a bit of a roller-coaster ride. Look out for the prolines, which will definitely throw you for a loop and possibly make you woozy. Well, if you haven't guessed by now, I have a lot of fun collaborating with a wide variety of very brainy people as principal developer of Jmol. Both of these projects involved great challenges that pushed the limit of what could be done with Jmol and molecular visualization in general. It has been a great ride!